• Evangelize. The heart of evangelization is the cultivation of a personal relationship with Jesus Christ — nurtured through prayer, Scripture and Sacrament, especially the Eucharist, which is the fire that impels us to share our faith with the world. • Strengthen faith communities at all levels — friends, families, parishes, schools, inter-parish, vicariate, diocesan — through prayer, resource allocation and the works of mercy. • Develop vocational and mission awareness at all levels through discernment, formation and empowerment. • Care of the poorest and most vulnerable — within and beyond our faith communities — at every stage of life, from conception to ­natural death. • Engage all diocesan agencies in support of the above, especially in parishes. 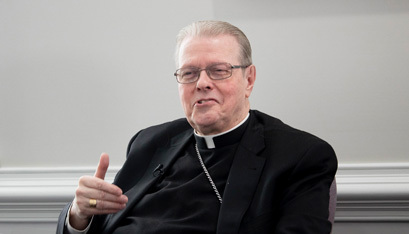 Bishop Edward B. Scharfenberger is celebrating his fifth anniversary on April 10 as Bishop of Albany. 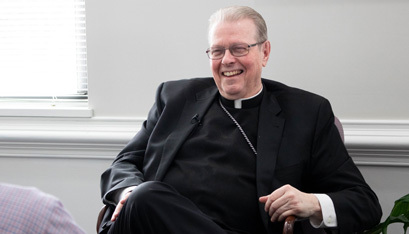 Bishop Scharfenberger talks with Mike Matvey of The Evangelist about his memorable moments, his relationship with politicians, his family, what he would serve at a dinner party and if the Mets will win the World Series this year. 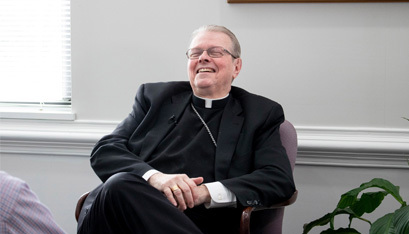 TE: It has been five years since you were installed as the 10th Bishop of Albany, I am sure the time has flown by. Do you have a memorable moment of the five years? BE: I think of my tenure here as a developing relationship. Certainly, the very first day (was memorable); it was a wonderful showing of joy and solidarity. They say first impressions are lasting impressions, so I would say that first impression that I had of being with the priests and the people of the Diocese … I felt it was a graced day and it was a wonderful turnout of many, many people. It propelled me moving forward. The second memorable thing is my joy in getting around to meet people in the parishes. I enjoy the uniqueness of every parish. Obviously, we are all Catholic and we have things in common, but I also appreciate the local culture. It’s like getting to know different families and different personalities and I think every parish has its own parish-o-nality. And that has been a joy to me. Most recently, the event that we had in Auriesville, where we had the Eucharistic Congress, which was an example of incredible, collaborative work. They were a group of people, of religious, lay people, clergy, deacons who came together and everybody had a role. It was sort of like a diocesan Super Bowl. That would be a high point for everybody in the Diocese. TE: Tell us about one of the cornerstones of your mission: Evangelization. BE: The Church exists for evangelization, that is a direct quote from John Paul. We exist to spread the message that Jesus is everyone’s Savior and He loves all of us and invites all of us into God’s family. And that is really what the Church exists for. That’s foundational to the mission of not only the Church, but of every disciple of Christ. Our commission from Jesus is to make other disciples. So how do we do that? We do that by walking the walk. That is No. 1. TE: How will you continue doing that in the next five years? BE: The way we are trying to do it is to encourage not only individuals, but every parish to come together and identify what they believe are those that they most wish to reach out to and to strengthen. So every parish take a look at itself and say ‘Whose voice is being heard and whose is not?’ Are we welcoming? Is there an atmosphere of welcome in our parish? Is this a place where people don’t just come to fill up a pew on Sunday … but do people feel (they) are being fed? Being fed spiritually. But Jesus came to save the whole person, so it’s not just spiritual enrichment. Spiritual, emotional, relational. Do I feel accepted as the person that I am? Do I also feel that my desire to grow on my journey of faith is being addressed? Do I feel I have friends here? Do I feel this is a place where I can get healing? Where I can get perhaps some good advice. Do I have somebody that I can talk to that I can share my questions with too? Is this a community where I can find guidance, health, support that will help me make my decisions better? TE: How do the parishes help foster community? BE: That’s exactly what every parish has to continue to keep asking itself. My favorite definition of parish is: A parish is a family of families, and a family for those who do not have family. So a parish (fosters community) by being a family, by regarding every member, every person, not only those that are in the pews on Sunday. How does the parish define its mission to be able to reach out to all of those in the community, including the interfaith community? I always like to think of parishes as beacons of light for those that are searching to see where the Lord is calling them forward. And they do it very specifically by social service programs, sometimes meeting basic needs, helping people through a difficult financial time. But I would like us to go even deeper than that; to carry on more personal conversations. We all have times in our lives when we feel isolated and disconnected. I think parishes should always be seeking to make those connections. It could happen in many different ways. I always like to see it when a priest can take the time to stand at the back door of the church as people leave. If for no other reason than just to say hello. Or to notice who might not have been there recently. That sense of feeling that it matters that I am here and I am loved and accepted as a family member. TE: How do you continue to grow vocations? BE: We have to talk about it. We have to say, for example, don’t be afraid to ask the question: Where is the Lord leading me? When I think of vocations, I take a very broad view. I am not only thinking about vocations to the priesthood or religious life. Lay leadership is absolutely essential. Going forward all of our experience is showing that the Church works best when lay people, and clergy and religious collaborate. And I say on equal footing. We have different roles; we are all equal in God’s eyes. We all have different roles, and those roles have to be drawn out more. Vocational development is something that all of us need to be involved in. To be asking the question: How do I find my place as a member of the body of Christ? Whether that is through marriage commitment; through bringing children into this world; through nurturing family life. … Whether that is in single life. I encourage parishes to have vocation committees and their specific purpose is to pray that God will send vocations into their parish and Diocese. But also to be aware, of not always just young men and women, but men and women who may be searching to find out where their call is. And to make the ask. Time and again we find that the decision to enter into a particular vocation was made because somebody was specifically asked, invited. TE: Being in Albany, your role has put you in contact with many politicians, most famously Gov. Andrew Cuomo. How do you mix the pastoral with the political? BE: What I always say is that my door is always open. And I also do try, in every way possible, to engage on a personal basis our local politicians. I don’t discuss who I meet with or when I meet. And I will say this to every legislator: “I want you to know that whatever we discuss here, will remain confidential.” And in the course of those discussions, I will obviously discuss issues that may involve their own faith, their own political decisions, the impact of those political decisions. Mostly the type of political discourse that I would engage in would be something that I would feel like I can put out publicly. … I seek to do it by way of trying to enlighten people of what I feel are the implications of certain legislative decisions. I have been very, very specific on explaining about what was at stake (with the Reproductive Health Act), that this was a piece of legislation proposed by radical abortionists in the Spitzer administration back in 2006, 2007. When the senate flipped last November, it was one of the first things that went forward. And, of course, the Governor has been very much in proposing it. My big concern has been to try to cut through a lot of the code language. The notion that, for example, promoting abortion really does help women. I think it’s more of a failure on our part; to support women that are making this very difficult choice. And that’s where parishes come in again, too. It concerns me, for example, that a single mom or even a teeanger who becomes pregnant, would the first place they would think of going be their local parish? Will they find somebody there that they can actually walk with without fear? We have to create an environment whereby people who are struggling with any issue...do not feel alone, that they do not fear that they are going to be rejected or cast out if they have a problem that may be embarrassing to them. TE: How do you reach kids in the digital age? BE: There is a distrust of being roped in by an institution. I think it’s partly the commitment that those things involve, too. If you become a member, you are going to have to pay dues. There is a lack of trust in organizations in general. But they do have social needs, they do like to come together. I don’t think we need to always sell them donuts and coffee and hard chairs, maybe we can provide a more comfortable place where young people can come together. I do know there are some groups of young people in the Diocese, the Frassati group, for example, which meets every Wednesday in the Franciscan chapel on Wolf Road and I join them many times. And they will come together; they will pray. They will talk about issues they are dealing with. They come together in a prayerful atmosphere, a social atmosphere and maybe afterwards have a pizza. Young people also want to be more than volunteers to hand out bulletins. One of the things that I’ve heard from so many young people is, ‘We get the fact that you wish we were in pews more, and we like the Church, but when we show up all you do is give us bulletins to hand out. But we have some ideas we would like to share.’ I think listening is very, very important. Young people need to be heard; they are a vital part of our community. TE: How do you give Catholics hope in a very challenging time with the sexual abuse scandal that things will change? BE: We need to listen to survivors of sexual abuse. Not only by clergy, but within homes and by family. I want the word to be very clear that we love survivors. I understand that many of them are very angry and the last place they might want to be in contact with, unfortunately, is a building with a cross on it because of the emotional scars, and there’s a need for that anger. And it has to be accepted. But then we have to get beyond that and we have to realize that whatever wrongs may have been done, we have to be about healing as well. 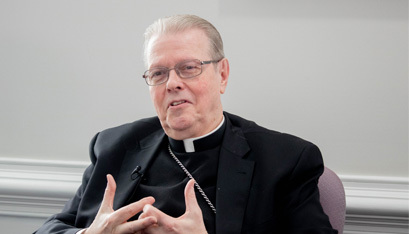 … We all want to see universal change, and it has to happen, whether that’s climate change, whether that’s change to more democratic structures, less tyrannical structures, whether that’s more transparency in the Church itself, but we also have to build locally, our families and our parishes. …. What I am doing institutionally is in every way possible to encourage transparency, openness, and I have some plans in that regard for an even more visible way to take some specific action. TE: Talk to us about the influence of your mother? BE: My mother is 98 years old right now. And she was born in Dubuque, Iowa. She was the child of what we used to call a mixed marriage. My grandfather, Max, was Jewish and my grandmother was Catholic. She grew up in that interfaith environment. She was a product of Catholic education. She went to Holy Ghost school in Dubuque. Both of my parents, they met during World War II, my father was in the army, my mother was studying dietetics. They had a stable marriage. My mother came East to live here. I am the oldest of five. My mother and father, I can’t single out which one had more influence on me. In many ways, I am more like my dad, personality-wise. Both of my parents were very dedicated to the family and that’s more than anything else what I learned from them, that family came first. Even though my father was an attorney and my mother professionally was a dietician. We always felt that we were really the center of their life. But also that our faith was very much important. We said the rosary at home. We had an image of the Blessed Virgin Mary in the niche, which my mother put there with a little vigil light, so we were always aware when you entered or left the house that you were under Mary’s eternal protection. We did have a cross in every room in the house. They sent us to Catholic school. They didn’t always agree with the priests and the nuns in the parish. We recognized that priests and nuns were human beings. So I think that probably when I started thinking about being a priest, I don’t know if I had this idealistic view of priests as perfect.I think it was the work that they did and what they represented and what I saw the Church stood for instead of the personalities. Same with my parents; they weren’t perfect. I do see my mother, at least three times a month. And I do call her every day. I think the part of her own longevity is also based upon her awareness that the family sticks together and that we support her as well, too. TE: In your search to find “Brooklyn Pizza” in Albany, have you found a favorite spot? TE: You are known to be a good cook. What would you serve at dinner? BE: I knew nothing about Italian food growing up except spaghetti and meatballs. We had Italian people on the block, and we assumed every night they ate spaghetti and meatballs. When I went to Rome, I was blessed to go to North American College and I was amazed to discover that Italians eat other things besides spaghetti and meatballs. My inclination would be to serve something that I learned from over there that is not as common here. I might try to make a spaghetti alla carbonara, bucatini all’amatriciana, which is a Roman dish. I like to cook Roman dishes. Nowadays nobody has any room for seconds after the pasta, but if I do make a second course, one of my favorites is saltimbocca with not too much extra ingredients, just a little bit of chicken or veal. Little bit of prosciutto. Finish it off with some wine sauce. Keep it simple. TE: Are the Mets going to win the World Series this year? BE: When I go to Church, I like to suffer. I have always been the kind of guy who says, ‘I don’t need the air conditioning.’ There’s always hope. Hope springs eternal.